Butler Management owns and oversees more than 250 downtown Madison Apartments, so we know a thing or two about downtown living and the lifestyle that goes with it. Our apartments provide all of the amenities to make your home convenient and comfortable all while being in the bustle of Madison's UW Campus, close to the downtown nightlife and the best Madison has to offer. Enjoy being close to everything while still having easy access to transportation when you need it. Use this section for tips and tricks about navigating your new neighborhood and making your transition and time in your apartment as effortless as possible. Being in the middle of everything makes it easy to get around. You can walk to grocery stores, community events, Farmer's Market, concerts on the Square, museums, classes, restaurants and some of the best sites Madison has to offer without breaking a sweat. 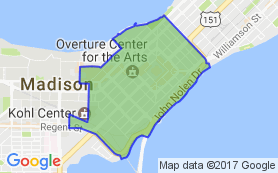 Downtown is the 2nd most walkable neighborhood in Madison.